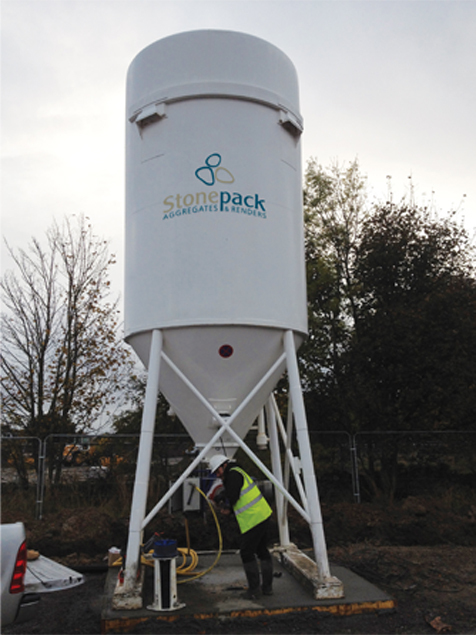 Stonepack Renders are available through our modern transportable silos. These sealed containers are delivered to you on-site and feature an automated mixing system that blends water with dry render at the push of a button. The result is a high-quality and consistent product that is easy to use. Whatever the weather, whatever the conditions, Stonepack Render silos produce a consistent mix that delivers a quality finish time after time. Protection from the elements and computer-controlled mixing results in reliable consistency from start to finish. Ready made Render means more time is spent applying rather than mixing. Mix as much or as little as required at the push of a button, reducing wastage. This material is also not exposed to the elements which also helps minimise product getting damaged by weather or site traffic. Storing up to 30 tonnes of material within a 3m*3m footprint, Stonepack Render silos require fewer deliveries which means less site traffic, take up less space and improve the overall site presentation.